The ongoing culinary experiment known as Test Kitchen continues to bring in stellar guest chefs and mixologists, and last weekend was no exception: Alain Giraud was in the kitchen, while Zahra Bates (Providence) and Davidson Fernie (La Descarga) were behind the stick. 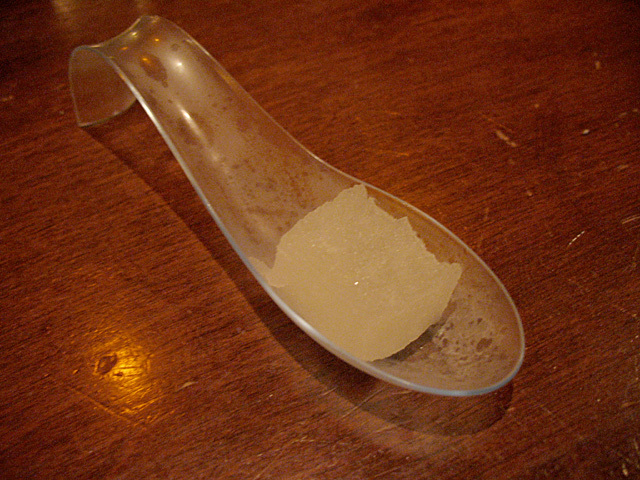 As I sat down at the bar (the restaurant is frequently booked but walk-ins are always welcome), Bates served a Moscow Mule gelee, a refreshing amuse bouche of vodka, lime and ginger with flavors that opened up as it warmed. I was feeling the effects of an epic week of cocktailing that included Dominick’s, Roger Room, the Atlantico Rum launch at La Descarga, The Macallan in Lalique auction, Buffalo Club, The Arsenal, Liquid Kitty, Big Bar and Caña. With that in mind, I began with The Coda, made with Elijah Craig 12-Year Old Bourbon, espresso, orange curaçao and Luxardo Maraschino Liqueur. Bates said The Coda was inspired by a visit to Intelligentsia, and her goal was to convey the coffee’s chocolate and citrus notes. 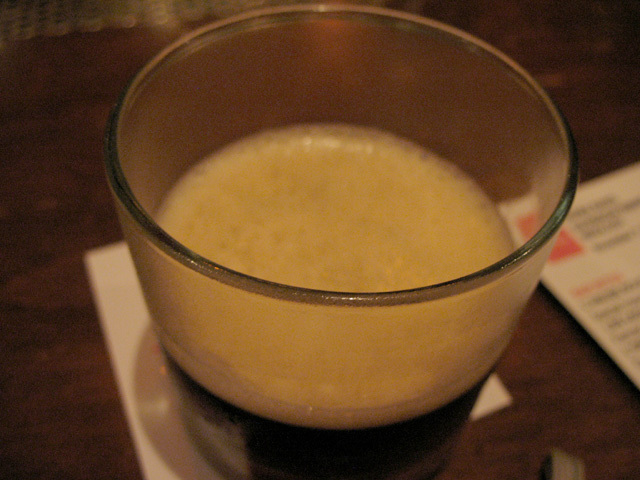 It was an excellent drink, with a rich depth of flavor and a much-needed caffeine kick. Judging from the number of orders, the PB ‘n’ J seemed to be a bar favorite: Cruzan Rum, pineapple and lime juice, jalapeño honey and basil bitters. From the sip I took I could see why customers would go for the PB ‘n’ J’s sweet and spicy kick. Zahra Bates mixes her Old Pal variation. One of the cocktails on the menu was named The French Tickler, a bespoke cocktail in which guests are asked to “Pick your poison, choose your flavor and leave the rest to us.” I asked for something brown and bitter. As she made my drink, Bates told me that a customer had made a similar request the night before, and she asked him if he had heard of the Old Pal cocktail. He hadn’t, so she did her own version, which is what she made for me: bourbon, dry vermouth, Allspice Dram, house made anise bitters and cardamom bitters. Another winner, a well balanced cocktail that I enjoyed even more than The Coda. 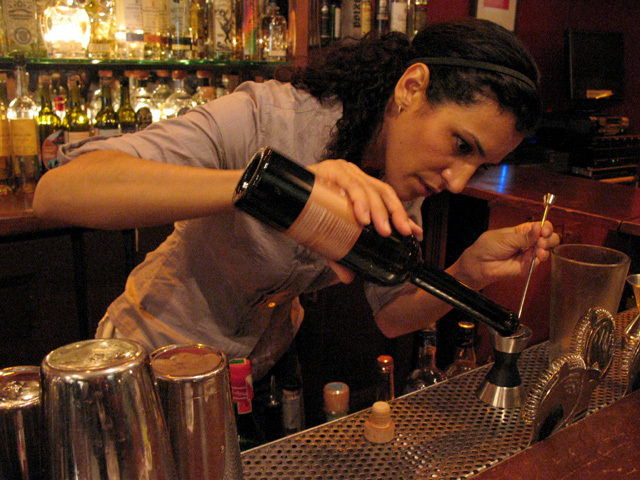 Bates said she loves bartending at Providence, where she’s given free rein to let her creativity flow. In addition to her regular gig at Providence, Bates will be guest bartending at Copa d’Oro on two consecutive Fridays, November 12th and November 19th. The one and only Lindsey Johnson (Lush Life Productions) was in town and was originally going to stop by Test Kitchen that night, until she was kidnapped by Caña GM Allan Katz and somehow ended up in Studio City. (When Allan is involved I’ve learned not to ask.) Fortunately we were able to meet for a drink at the Library Bar, where Matt Biancaniello started me off with a fig-infused Sazerac that might ruin me for any other version. And then who should arrive but Bricia Lopez, who was attending an AFI party across the lobby and stopped by to meet Matt. Of course, we asked him when he would add his own creation to the list of Bricia mezcal cocktails. 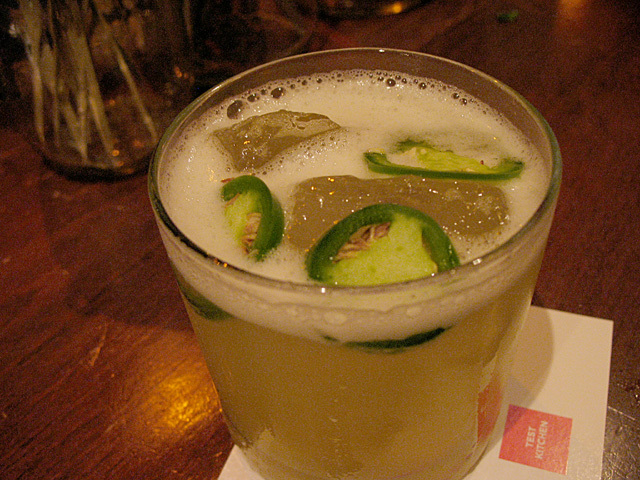 While he didn’t have all the ingredients he wanted on hand, he did make a mezcal drink that Bricia enjoyed. Later that night I was introduced to Golden State co-owner Jason Bernstein, and as we got to talking, it turned out that HE was the Test Kitchen customer who had inspired Bates to create the Old Pal variation! Cue the spooky Theremin music.